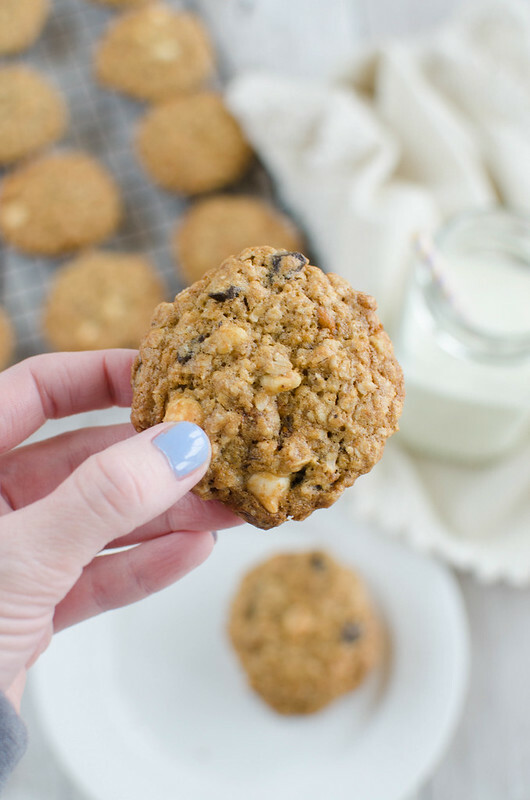 Kitchen Sink Oatmeal Cookies – oatmeal cookies filled with everything but the kitchen sink! Chocolate chunks, white chocolate chips, cinnamon chips, walnuts, raisins, and coconut! When we moved I realized I had a lot of mostly empty bags of chocolate chips. Same goes for pecans, shredded coconut, almond meal, bottles of vanilla, all the stuff I always think I’m out of when I’m out the store and apparently am never actually out of it. Plus, 15 packages of almond bark even though I only use almond bark once a year for crockpot candy…? I don’t know, guys. I guess everyone I know is getting crockpot candy for Christmas next year. 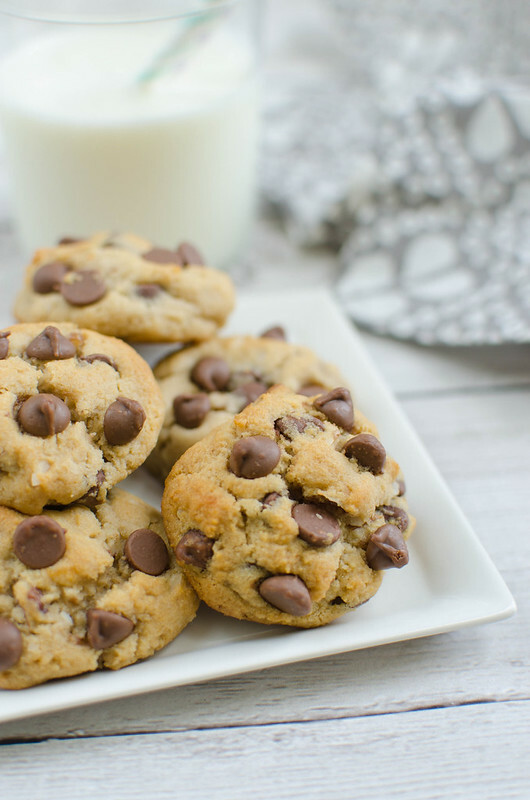 Paleo Chocolate Chip Coconut Cookies will be your new favorites, for all time. 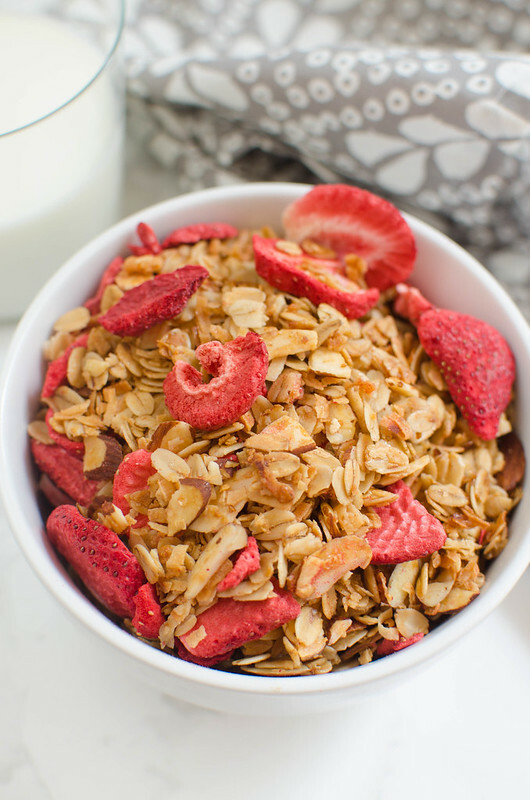 Paleo or not, these babies are gorgeous! I’m having this thing with coconut this summer. It started with this peanut coconut sauce that I was making daily and putting on everything and now I’ve moved onto cookies. I mean, can you blame me? Coconut and chocolate is such a perfect combination. Naturally, I’m obsessed with these Paleo Chocolate Chip Coconut Cookies. I have been making a batch almost every week and then I’ll make some paleo ice cream and I’ll count down the minutes until the kids go to bed so I can sandwich the ice cream between these cookies and enjoy them in total silence. 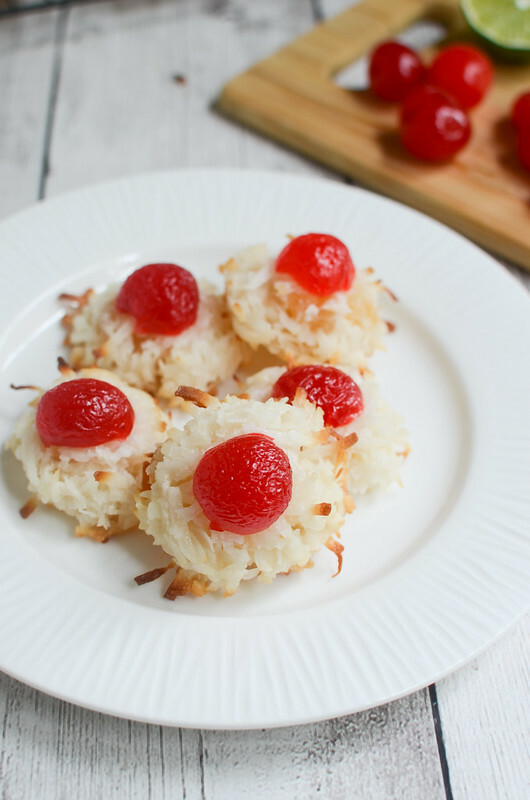 Ambrosia Macaroons are a delicious twist on the classic coconut macaroons. Made with coconut, dried pineapple, orange zest, lime juice, and a cherry on top! I’m so into making cookies right now. I have 3 different cookies on my counter right now. I’m refusing to try any of them because I know if I have one, I’ll have to have them all. But these! I made these weeks ago and ate way more than I’m going to admit to you today. I cannot resist a coconut macaroon! Originally published on February 19, 2011. It’s that time of year. You know what time I’m talking about. Girl Scouts have positioned themselves outside every grocery store, drug store, ballpark, everywhere you could possibly need to go. I try, I really do – I try to walk past them without making eye contact. It never works. This year was no different. I ended up with a box of Samoas (what’s the new name? Caramel something-or-another?) that my children demolished within seconds. 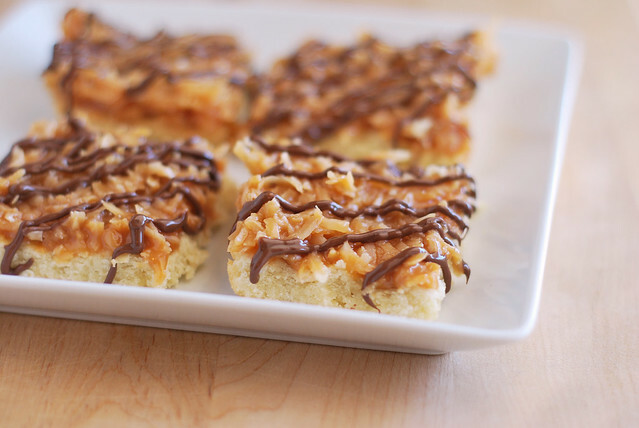 These bars, which are meant to be like my beloved Samoas, have been on my must make list for years now and I am so sad that I’ve waited this long to make them! 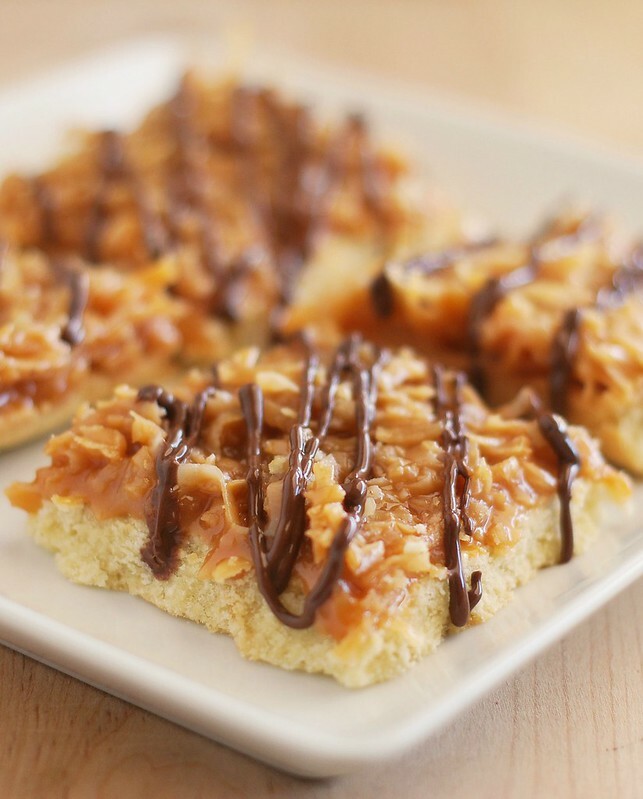 They are so easy, so quick, and taste exactly like the Samoas. Please don’t be scared of the 3 steps. I’m telling you, there’s nothing difficult about this recipe. If you wanted to take these one step further, you could dip the bottoms of the bars in melted chocolate. I’m not a chocolate fan so I skipped that part but if you wanted to, just melt a bag of chocolate chips instead of the 1/2 cup that this recipe calls for. Once it’s melted, dip the bars one at a time and then place on parchment (or wax paper) to harden.